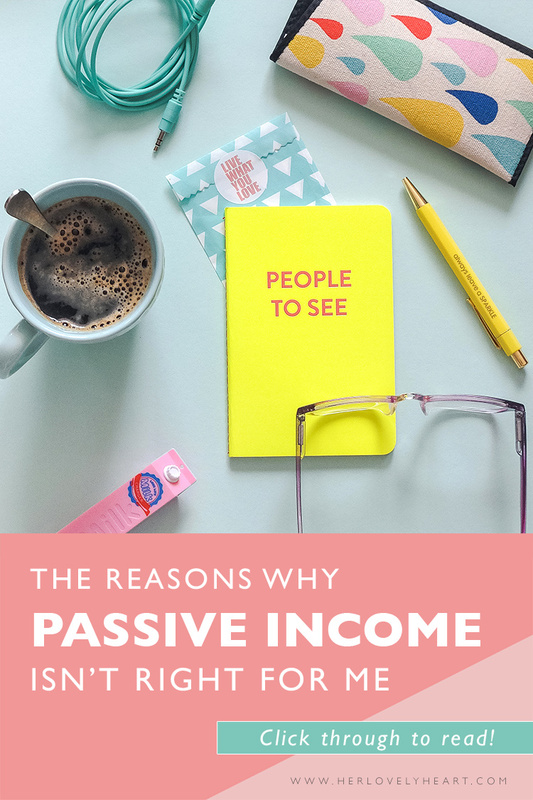 There's one phrase that's thrown about very loosely online, and that's ‘passive income'. I myself am guilty of using that phrase rather liberally in the past, and I have also at times let it cloud my own motives when thinking of new services to offer. Never more so than when building my new membership site The Breakfast Club. I built it as an answer to having gotten tired of the constant need to ‘launch' new things when I wanted to put out a new course or tutorial. I had this idea of having a place for all the courses and resources I'll ever put together, so that all members would automatically have access to everything, instead of getting a new sales pitch each and every time I wanted to release a new resource. Originally, I had visions of opening The Breakfast Club to everyone. The numbers worked and it felt like the ideal little ‘passive income stream' to add. I'm so glad I decided to test the idea before actually going ahead and launching, as I found myself making a complete 180 in the process. Even though I was testing with a very small number of members, it was clear from the beginning that there was a whole new level of responsibility involved in making sure everyone was happy and getting enough value. I quickly realised what a massive customer service demand would be attached to running an open membership platform. Plus there was this niggling uncomfortable feeling I couldn't shake. I realised it stemmed from the fact that, having previously sold some courses through a different platform, the one thing I really didn't enjoy about the process was the impersonal aspect of not fully knowing who exactly would be signing up and whether it would even be the right thing for them or not. After a lot of soul-searching I finally had to face the fact that, perhaps, passive income isn't something I actually want to pursue right now. The hype is that your passive income stream will allow you to lie on the beach while the money keeps flowing into your account. But depending on your business structure, often ‘automated' does not equal ‘passive'. First of all, there's usually a helluva lot of work involved up front in order to set up that passive income stream, whether it's an e-book, an online course, or, indeed a membership site. Most people who dream of passive income are ok with this. The idea being is that if you put the work in now, you can then just sit back and watch your bank account soar. Unfortunately, it's not quite as simple as that. Whenever you're selling something, you are always dealing with actual people, no matter what your method of selling is. When we talk about passive income models the number of those people usually grows exponentially, which means you will have your hands full with keeping your tech and processes faultless, while also being prepared to handle a much higher number of customer service enquiries. (Let's not even mention all the time you'll be spending on putting together pitches and launch sequences). If, like me, you don't want to have a big team, a passive income stream can quickly start looking like a whole new kind of world of pain. Also, if you do hire that team, how does your business actually differ from any other business out there? There's not really anything passive about managing a team, I can tell you that much. Last year it became compulsory to collect and pay VAT (value added tax) in the EU country where the buyer of your digital services resides. If you sell digital products or courses to EU countries, but you've dismissed these news because you are not currently VAT registered yourself, you should probably think again. Even if you are way below the VAT threshold yourself, this doesn't matter, you are still liable to collect and pay VAT for every sale you make to an EU country (plus you have to collect information and keep records of every clients' whereabouts). The legislation was changed to make the playing field more even for bigger companies. Unfortunately, no-one stopped to think about the micro businesses out there who would fall victim to a crazy administrative burden just for selling a handful of downloads or digital courses to EU countries. There's a good article explaining the mess here (or, if you are based outside of the EU but sell digital products to people inside the EU, you might want to read this), although there has been a lot lof lobbying done since it was written, which has resulted in some nudges to a more positive direction. For example, if you are under the VAT threshold, you are now able to register for VAT only for the purpose of collecting and paying EU VAT via the VATMOSS system, without having to charge VAT on your sales in the UK or outside of the EU. While everyone's holding their breath, hoping that a threshold will be put in place in order to spare micro businesses from having to deal with EU VAT, and while also trying to see what will happen whilst the UK leaves the EU and presumably the VATMOSS system (in which case you would have to individually register for VAT in all the EU countries you want to sell digital products in), I'm steering clear. Her Lovely Heart is not my main income source (I'm a photographer by day, in case you didn't know), so I simply don't have the time or resources to comply with this crazy legislation. If a threshold is put in place, I might reconsider. This is the biggest reason for my decision to saying no to passive income when it comes to educational products. When I know my clients, when I get to interact with them and see that they are implementing things in the right way, I feel excited and positive. I come away from a mentoring session or an exchange of emails with a feeling of ‘job well done', and I won't feel guilty for having a break or calling it a day. But when I sell stuff to a faceless sea of people, I constantly feel anxious about whether they are getting enough value, whether thighs are actually working for them, and who in the hell they even are. I feel like I'm never able to relax as I have to be prepared for a worst case scenario and I never get that satisfying feeling of helping someone. Yes, the money might be coming in, but even that gives me anxiety because I feel removed from the process. If anything, it makes me realise concretely that money is not the ultimate motivator for me, it's that satisfaction I feel when I know I have helped someone along their journey. And that's something I really don't mind getting paid for. I realised that when it comes to educational services, I'm at my happiest, and do my best work when I have that personal contact of 1-2-1 mentoring. That's the kind of work that fulfills me, and those are the people I want to give more value to. So, in the end, I decided that The Breakfast Club will be a (FREE) added benefit to all my mentoring clients. That might seem like a crazy missed opportunity, but it is truly the choice that makes me feel most at peace. If you've read this far, I hope you've felt that spark of connection. That gut feeling that says it's not a coincidence that you're here right now. I'd love for you to come on this journey with me! I want you to feel fulfilled and happy, instead of like you're always coming up short and feeling too quiet to make your mark. Let me support you on your entrepreneurial journey in a more gentle way. I want you to feel less overwhelmed and more empowered. I want you to feel free to ‘do you’. You can see my mentoring packages here. They all include an annual membership to The Breakfast Club. I LOVE LOVE LOVE your honesty here and how you’re not afraid to be different. Following the crowd sometimes feels more lonely than going out and doing something unique to you!